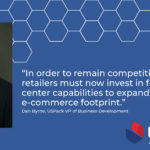 At USPack our focus every day is to help brands and businesses win in the delivery economy. That’s why we keep our finger on the pulse of the latest trends and developments that impact our business and our customers’ businesses. That’s how we stay ahead. That’s how we help our customers win.